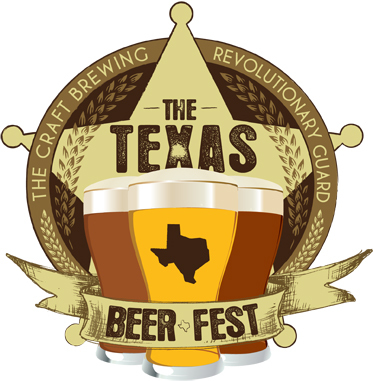 According to one of the organizers, about 1,500 people attended the inaugural TX Beer Fest last Saturday at the Humble Civic Center Area. The venue was about as good as I've seen for holding such an event as there was plenty of room to move around, covered to protect from the elements but with open sides to let a breeze blow through. There was also plenty of free parking. And for those that figured it was too far out to bother going to, the arena is right next to the Bush Intercontinental Airport. If you've ever driven to the airport, then you've basically already been there. 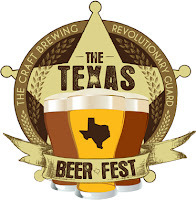 As the name of the festival implies, emphasis was on Texas breweries which were setup in the middle of the arena, their booths adorned with Texas flags. The rest of the participating breweries from the USA and the globe were setup around the outside perimeter. 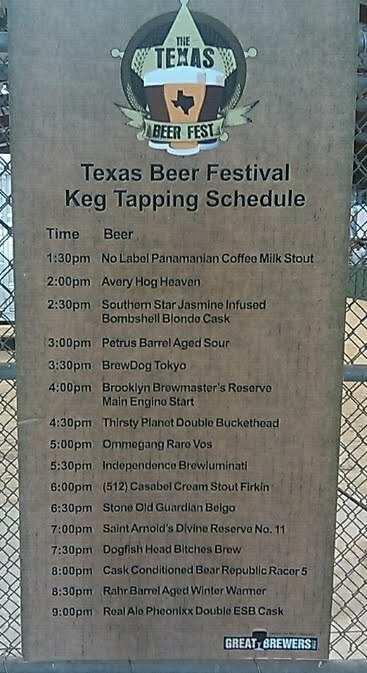 Some of the newest Texas breweries were also there (Cirle, New Republic, No Label and Thirsty Planet) providing a lot of people the first opportunity to try their beers. It will be interesting to see how many more there will be next year. Although most of the booths for Texas breweries also had brewery signs and banners hanging on them, a lot of the other booths had very little indication of what brewery it was for. I assume this was probably because they didn't have any brewery representatives onsite and their distributor didn't take the time to hang up any signs (or didn't have any). The festival lasted from 1pm ~ 10pm, which provided plenty of time for sampling of beer. Each ticket was good for one 2oz sample or if you preferred, six tickets could be traded in for a full 12oz pour. The ongoing tapping of rare and speciality kegs and casks throughout the event also provided a reason for festival goers to hang around. Rarely were there any lines at a booth (except for various times at the speciality beer booth) so it was easy to grab a sample and move on. I spent a great deal of time throughout the day pouring beer at the Independence Brewing booth and I talked with a lot of people who were new to craft beer. Its festivals like this, ones that have their focus on craft beer, that help increase awareness and promote the craft brewing industry. Congratulations to Cliff and Jake and their team who organized and put on a great festival as well as all the other events leading up to it.